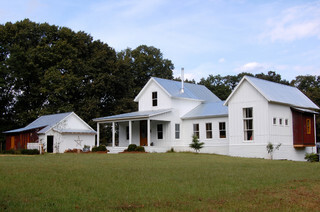 I could live here… COLORFUL vintage finds fill a modern farmhouse!! 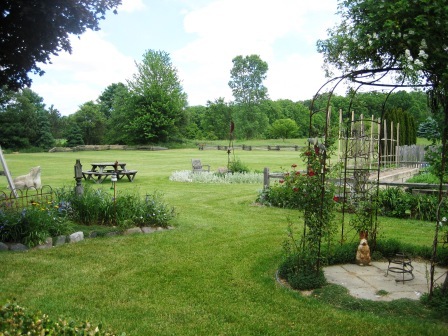 Take a peek and enjoy the tour! 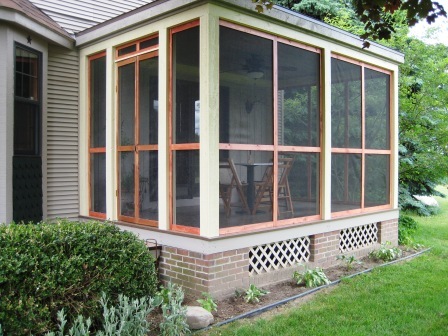 Last summer, I had a brilliant brain-storm (ONE of many) to re-do our back porch (aka DECK) into a more user-friendly ** and bug-free ** screened-in back porch. 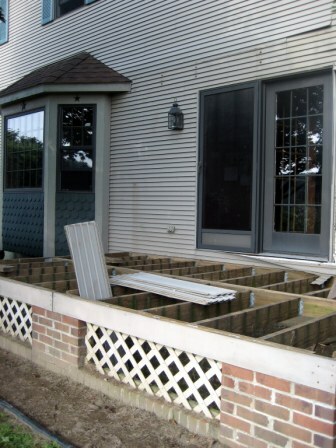 The former deck/wood was rotting, and needed to be replaced. Fast-forward six months…we ran out of time last summer/fall. Today, it’s almost finished…here’s what we ended up with. We were really challenged and limited with the roofline/pitch, by the bay window on one side and the shed dormer on the other. 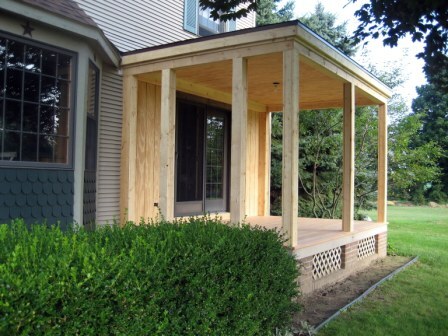 My hubby (the Big D), with input from myself and kids, sketched the initial concept, design plans and built everything from top to bottom (with help from all of us of course)… finally, our NEW back porch. 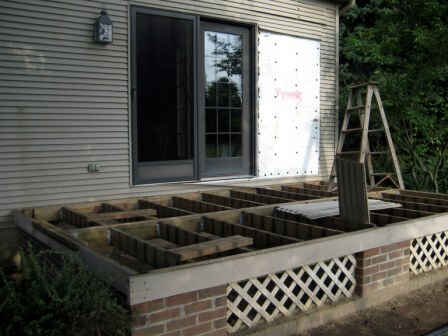 We worked within a tight budget and maintained the same brick foundation/overall footprint of the previous deck (also constructed by hubby and my now deceased father-in-law. 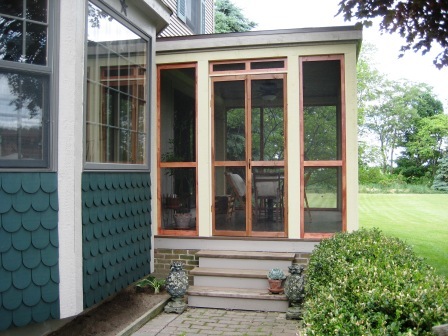 Thus, our screened back porch was ‘born’. 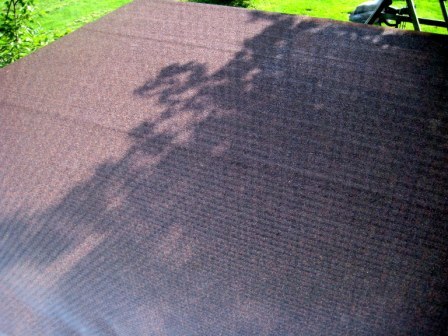 I must say, we’ve used it more in the past week than the entire existence of the former deck (roughly 20-years)! Next, I dreamed of lovely plants and more plants… even visited several greenhouses. 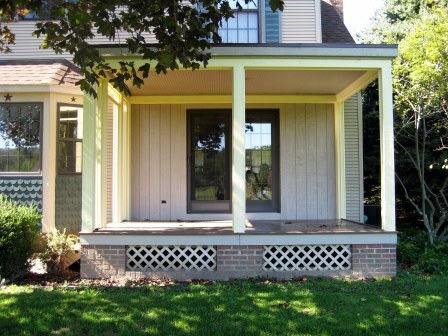 But, I decided to keep it simple (with all the other ongoing gardening chores) and simply divided and transplanted hostas from my existing shade gardens to the porch foundation. It’ll do for now. 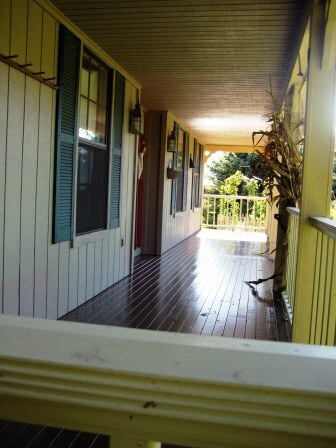 …another view of the back porch. We added a ceiling fan & light too (purchased on sale at Lowes)… carefully negotiating the door (narrowly missing the fan blades!!)!! OOPS! Totally missed that little design detail. 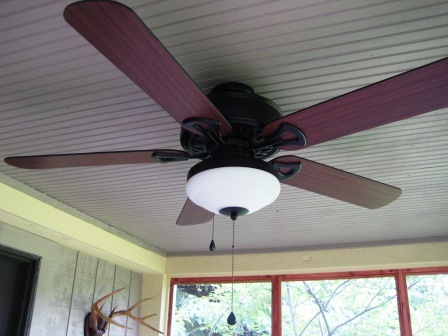 The light and the fan operate independently. I’d still like to ‘string’ little electric cafe lights around the perimeter of the porch too… for a bit of night-time mood lighting!? We also added a bit of outdoor-sy decor… mounted deer antlers: another flea market find! 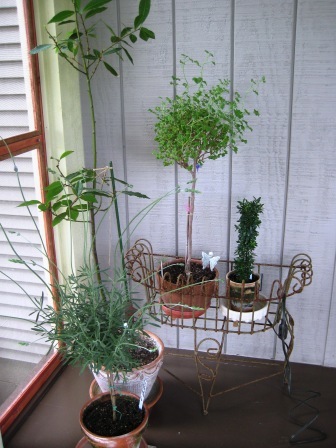 A few of my tender houseplants have also taken-up summer residence on the back porch as well. 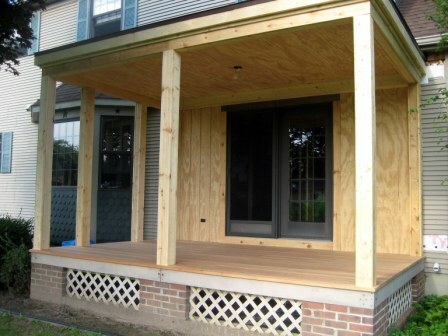 As for porch furniture… I’m still working on that phase of the project. 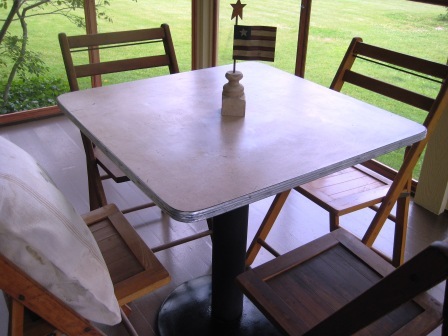 I did find this cafe/diner-style table at a barn sale last summer. I thought the heavy cast iron base would be perfect for blustery windy days. The table-top had been used as a workbench and had loads of paint and crap all over it. Dennis and I spent several hours sanding by hand to cut through all the crap and (surprisingly) actually found the original ‘finish’ much to our liking. Better leave well-enough alone! A good scrubbing, top to bottom, and we were able to leave the base in its original condition too! 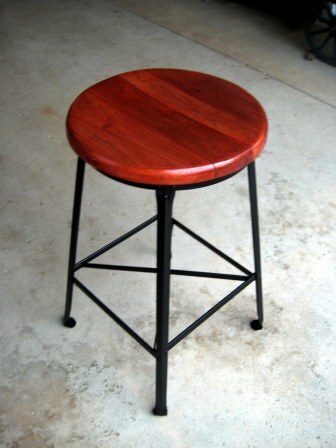 For now, I’m using simple wood folding chairs for seating, until I find something more appropriate???? 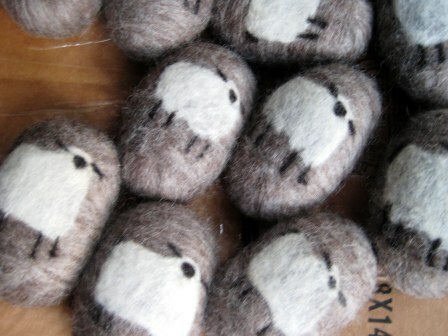 Maybe some grain-sack cushions would help? So, Katie’s wish is my command. 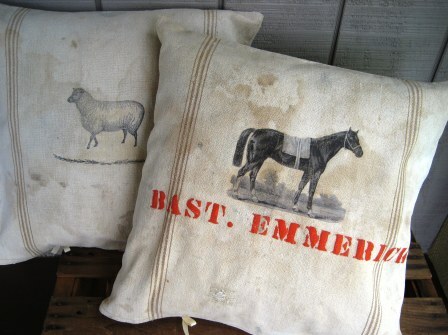 Ta da… two grain sack pillows I made today. 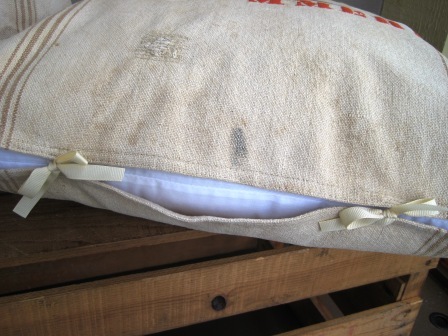 The pillow inserts (from JoAnne’s) cost more than the actual grain sack – another flea market find!! 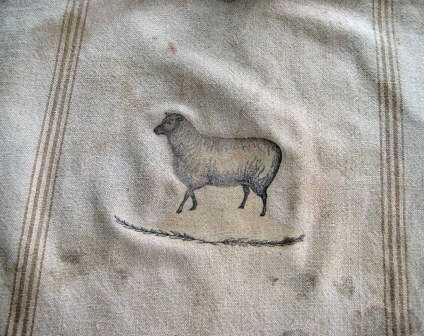 There are many $$ costly $$ vintage (European) fine linen and hemp grain sacks still available. 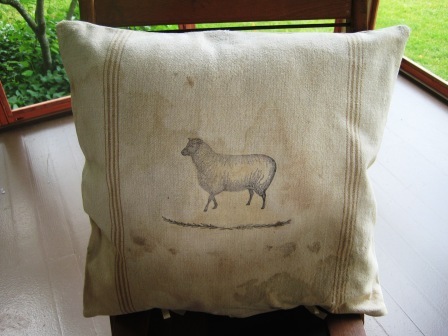 Oh well, my flea market canvas grain sack… a bit stained and tattered, still perfect for teenagers to knock around the back porch! Katie requested a ‘horse-y‘ pillow. 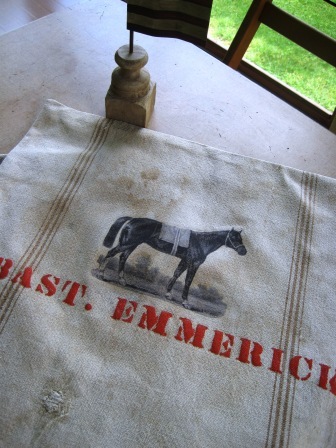 I used iron-on transfer paper (purchased from JoAnne’s) with my ink-jet printer and a wonderful horse image from the graphics fairy. 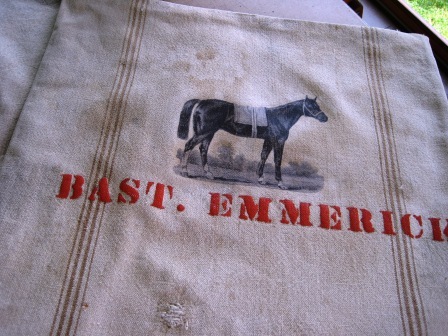 The stenciled letters were already on the grain sack! 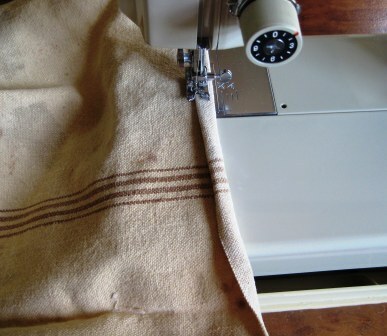 To begin, I measured and cut the grain sack in half (for two pillows), sewed the top seam closed and doubled-over the other end for the opening and top-stitched. I added ribbon ties to close (but, you could use loops and button or an envelope-style pillow too). They’ll be simple to remove and clean/wash when necessary. 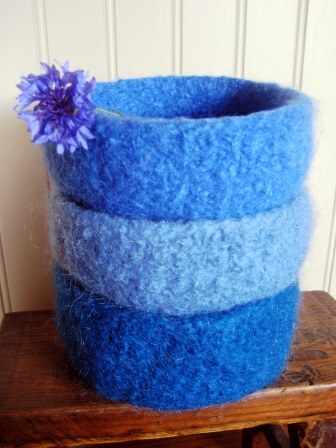 Now, I think I’ll contemplate making a set of four chair pads to match….? 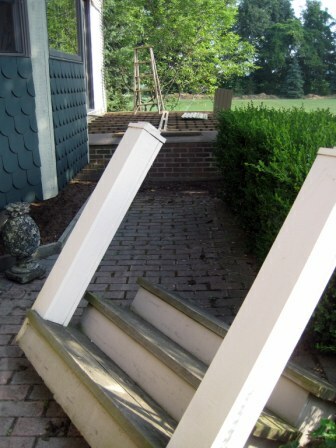 I’m sure I’m not alone when I say… do-it-yourself projects never seem to go according to plan! Life’s little diversions, the un-seen, the un-planned bits and pieces that all too often de-rail the best intentions. It’s ok. It just happens…and most importantly, it’s no one’s fault. 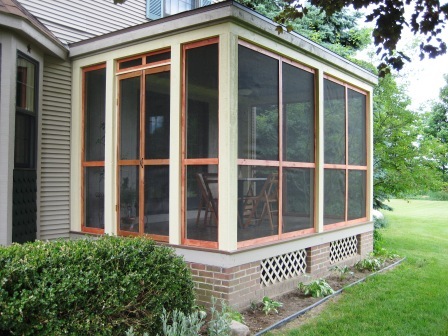 The rain and cooler temps, hubby’s work/travel schedule and my focused attention to prepare ONLY for the past fiber show… have all attributed to minimal progress on the screened-in back porch. 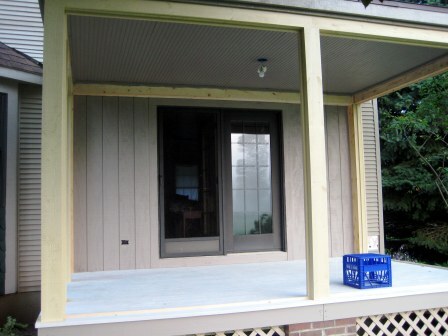 Hubby spent last weekend tinkering with ‘finishing’ details and re-installing the house siding. Well, let’s just say it’s prepped & ready for the next stage of demo. 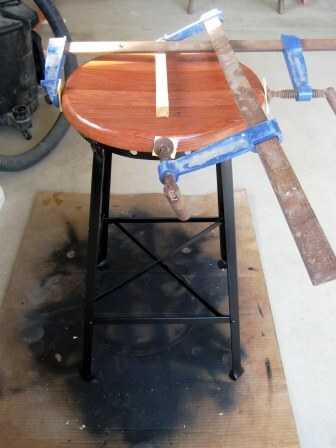 We need a good solid weekend to remove the stool, flooring and vanity…and replace/re-install the same…and have functionality by the end of the day! 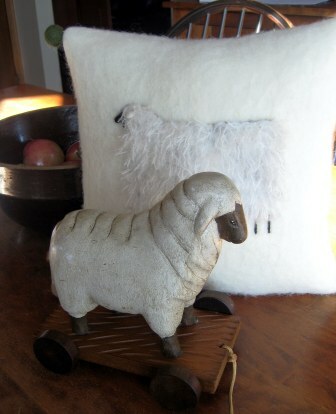 Before I sign-off, I wanted to share my latest flea market find: a $2.50 hand-carved little sheepy pull toy. Sweet! 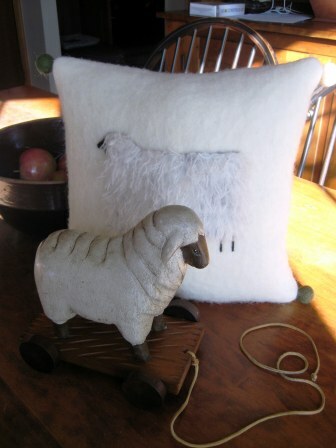 BTW, that’s a fuzzy sheep pillow I hand-felted/needle felted for a friend ~ in the background. The sun is shining here. I hope you enjoy your day! I’ve been occupied these past few days with the goat show at our local Armada Ag Fair (too much fun ‘playing’ with the goats and all the young showmen!). 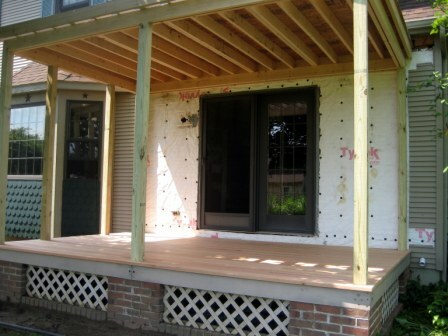 The south side will provide access to the porch from outdoors with steps and double screen doors ~~ all screen panels have yet to be constructed… Phase 2? We worked within the existing ‘footprint’. 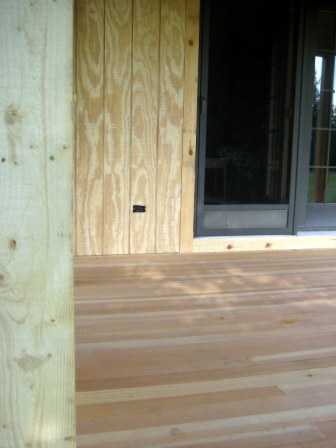 We replaced the vinyl siding on the house with T-111; the floor is tongue-and-groove spruce. All ‘surfaces’ will be painted…Phase 3? 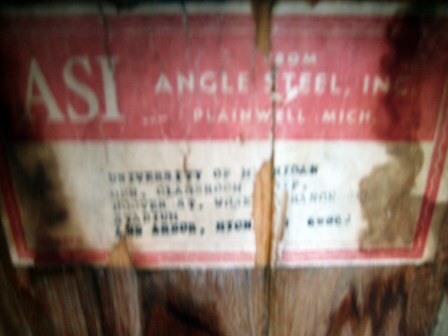 A close-up of the floor, posts, ceiling detail. 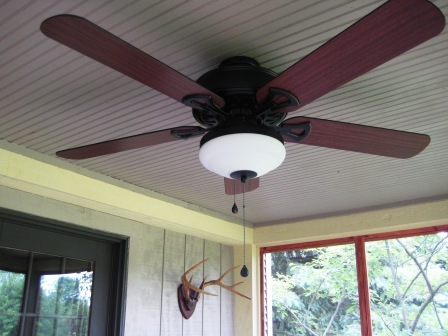 We plan to install a ceiling fan. 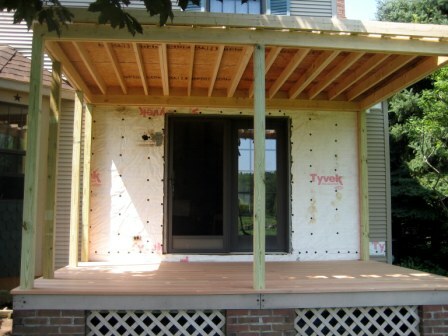 The porch ‘roof’ will receive a wood deck to create a second floor walk-out balcony…down the road. 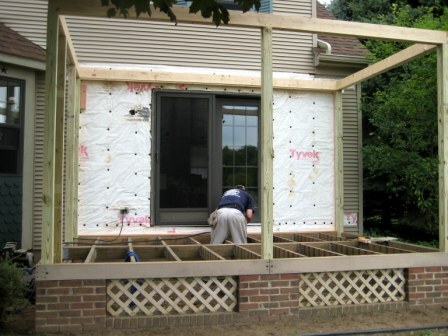 Next, we’ll construct the ‘removable’ screen panels, paint, purchase a fan/light fixture, consider plants for foundation planting…and finally, furniture!? 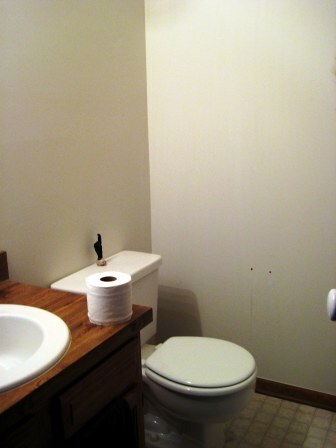 BTW, we haven’t forgotten the powder room make-over too. There’s been a little progress going-on behind the scenes. 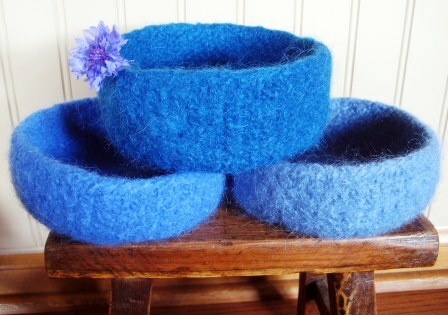 Like painting fixtures that I plan to re-use in the bathroom make-over. I also purchased an old, vintage door – my hubby wasn’t too pleased with me because it needs a bit of work…one more thing for him To-Do, er, fix…uh oh! Been trying to catch-up on all the work around here. I doesn’t take long for the garden to go native!!! I’m off to harvest basil before the rain! Before I sign-off, if you L.O.V.E. lavender and French country decor as much as I do, check out Dreamy Whites and follow her link to Sonoma Lavender Farm where she helped style a breathtaking wedding along with other talented artists!! Enjoy! 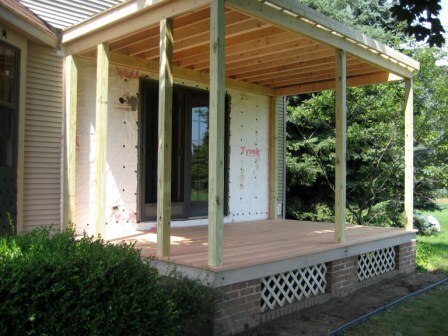 A bit of progress on the ‘back porch’ re-do…hubby is out and about tending to other matters. 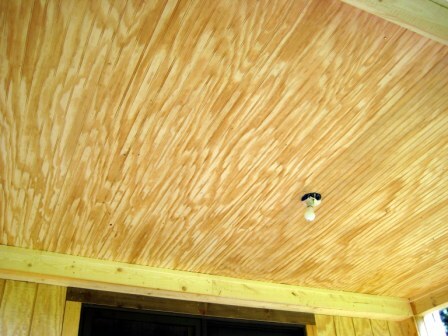 To recap, we completed most of the framing, the floorboards are installed and most of the roof is installed & protected with tarp paper. 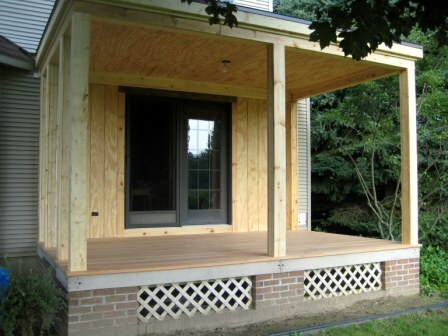 Ultimately, it will be protected with a rubber membrane, since it’s pretty much a flat roof. 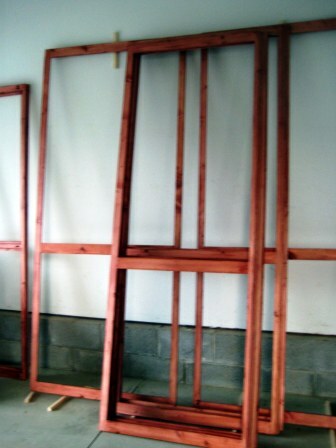 The door will be installed at this end. Katie’s bedroom window is above…she’s working on daddy for a second floor walk out balcony. How fun would that be? 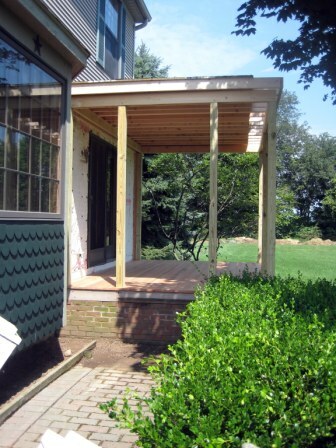 We’re working within the same ‘footprint’ of the original deck. 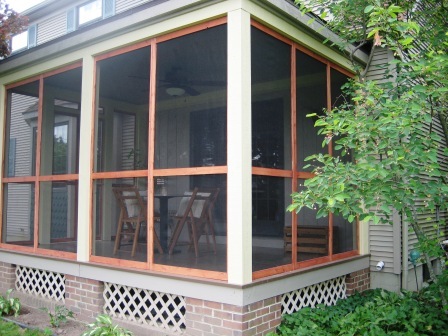 I think a screened porch will be more functional for us! It’s nice to see a little progress…slow and steady. Two projects better than one? Not necessarily! No. 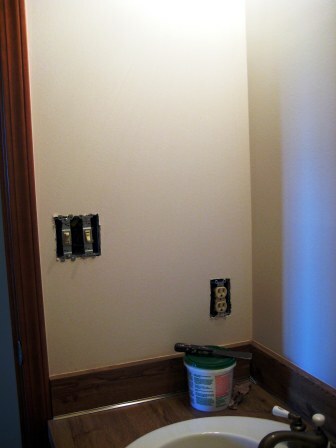 1 – We’re working on a half-bath (some folks call it a powder room) make-over. We’re waiting on the flooring that had to be special ordered. The wallpaper has been removed along with all the fixtures. I washed – scrubbed – the walls to remove traces of paper and paste. Whew! That was a workout! I’ve spot repaired/patched holes from screws and fasteners from ‘fixtures’ that will no longer be used. 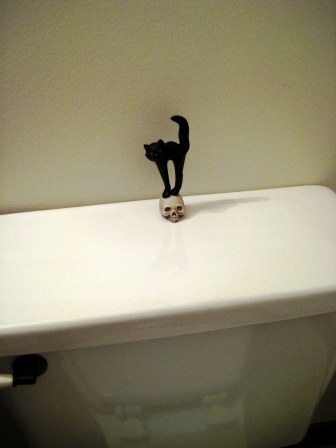 I’ve also re-painted the mirror and toilet paper holder…antiqued black. 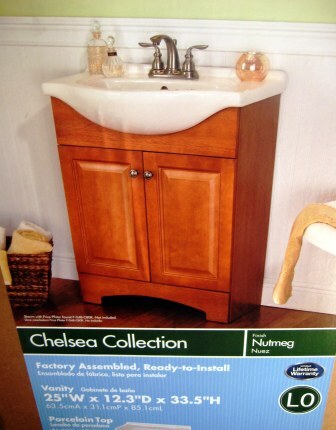 We also purchased a new vanity/sink combo (from Home Depot) that adds a bit of farmhouse charm. I found a re-cycled window made into/cabinet that will hang over the commode from a local antique shop. We’ve decided to work within the existing footprint (and brickwork). 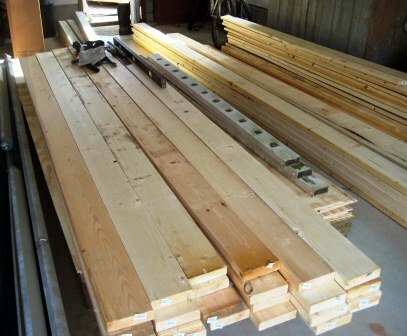 ALL of the de-constructed lumber will be stored and recycled for odd projects around the barnyard…no doubt! Remember, I wanted a ‘dog-house’ on top of the sheep’s play platform. Finally, some building materials $$$$! 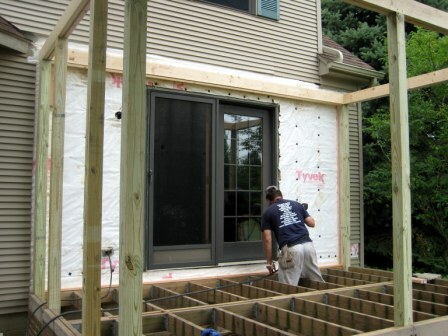 Next, we began construction…with a bit of framing for a new roof and frame-work for the screened panels. My father-in-law (now deceased), a retired bricklayer, helped us with the original brickwork many years ago. 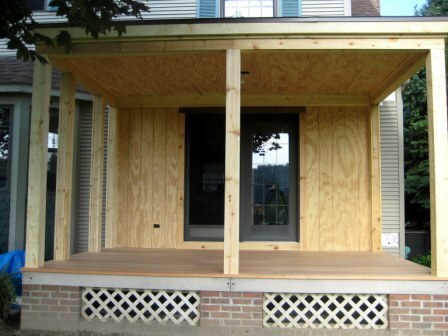 It mimics the front porch foundation. The past two days we’ve been hindered with rain…and tonight hubby’s just too tired to work. 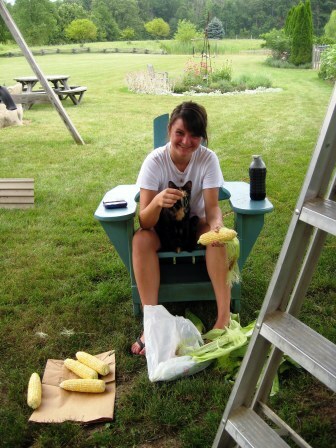 Katie is close-by to offer a hand…preparing dinner…which we’ll enjoy on the back porch ~ one day!